Here are some suggestions on having the family dramatize certain parts of the Christmas story, such as the Wise Men's journey to Bethlehem, or the Shepherd's Mass. 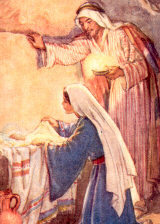 In some families, the events of the Christmas story are dramatized. For instance, the message of the Shepherds' Mass lends itself easily to drama. The family gathers around the crib and sings a few carols. Then the father reads the Gospel of this Mass aloud. As he says the words, "Let us go over to Bethlehem and see the Word that is come to pass," each child comes forward with a shepherd figure and places it ceremoniously at the crib. There is another charming custom which by all means should not be forgotten on Christmas Day. This is the beginning of the Wise Men's journey to Bethlehem. The three kings start out separately in far countries, perhaps even in such remote places as the children's bedrooms. From there they continue to advance each day, assisted by the children, on their hazardous journey over bookcases and mantelpieces — not forgetting their dramatic meeting in the hall about halfway to Bethlehem. At last, on Epiphany, they will arrive in all their splendor to pay homage at the crib. At another time during the day, many families re-emphasize the central fact of Christmas by acting out St. Luke's Gospel. The living room becomes a stage with more imagination than effort — and with a few odds and ends of material and old draperies the family and guests are transformed into the chosen group surrounding the Redeemer. Even the new Christmas dolls and animals can have parts to play. The Gospel forms the basis of the play. One person reads the story slowly and with care while the others act what is being read. No one can lay down rules about how the actors should go about doing this. In one family the "cast" may like to mime the Gospel; in another, the narrator may be adept at spontaneous dialogue. Still others may like to work from a simple script, and for these, a short play is given at the end of this book. This play has been worked out with narration, dialogue and music — chant selections for school production, familiar carol substitutes for the home. When done in the family, it is important to draw all present into the play. In this way, there will be no awkwardness because there will be no "audience" to satisfy. And then, those who join in will be able really to enter into the simple actions and to make an adoration of it. For more ambitious families or parish and apostolic groups, effective prayer-dramas can be worked out on the whole history of salvation as the Church sets it before us in the Advent-Christmas liturgy. Beginning with the fall in Genesis, a script can be built around the great prophecies of Christ's coming, reaching a first climax in John the Baptist, and culminating in the Christmas and Epiphany texts from Mass and Office.